Irish Car Bomb’s are one of my favorite drinks to have when spending a night out on the town. 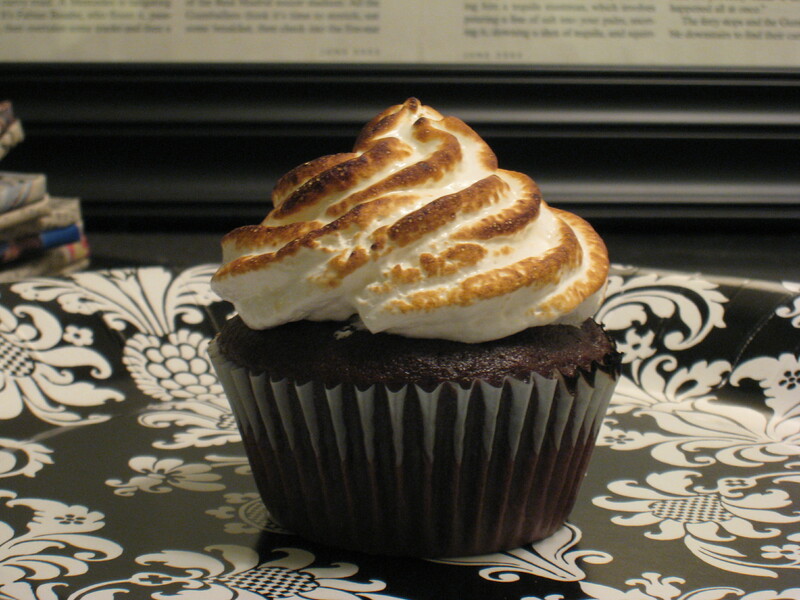 A dear friend of mine who knew I had an affinity for the drink sent me a link to a recipe for an Irish Car Bomb Cupcake. Could there be a more awesome cupcake in existence? I think not. Read, Bake and Be Merry! Make the cupcakes: Preheat oven to 350°F. Line 24 cupcake cups with liners. Bring 1 cup stout and 1 cup butter to simmer in a large heavy saucepan over medium heat. Add cocoa powder and whisk (mixture may seem to separate – don’t worry it will come back together when all the ingredients are mixed). Cool slightly. Whisk flour, sugar, baking soda, and salt in large bowl to blend. Using electric mixer, beat eggs and sour cream until smooth. Add stout-chocolate mixture to egg mixture and beat to combine. Add flour mixture and beat briefly on slow speed. Divide batter among cupcake liners, filling them 2/3 to 3/4 of the way. Bake cake until tester inserted into center comes out clean (or until they pop back when you press on them), rotating them once front to back if your oven bakes unevenly, about 17 minutes. Remove from oven and allow to cool. Make the filling: Chop the chocolate and transfer it to a heatproof bowl. Heat the cream until simmering and pour it over the chocolate. Let sit for one minute and then whisk until smooth. (If this has not sufficiently melted the chocolate, you can pop it in the microwave for a few seconds and then continue whisking.) Add the whiskey and stir until combined. Fill the cupcakes: Let the ganache cool until thick but still soft enough to be piped (the fridge will speed this along but you must stir it every 10 minutes). Meanwhile, using the #806 piping tip or a teaspoon, cut the centers out of the cooled cupcakes. You want to remove most of the cupcake’s center but not cut through the bottom — aim for 2/3 of the way. Press down the bottom of the cupcake (inside the hole you’ve made) with your fingers to make more room for the filling. Put the ganache into a piping bag with a wide tip and fill the holes in each cupcake to the top. Alternatively, if you are tight on time, as soon as the ganache is made (while it’s still liquidy) place is in a paper cup and pinch one edge to create a spout. Then pour the ganache into the cupcake holes. Make sure to stop before the ganache reaches the top of the cupcake to prevent spillage. If Meringue seems like to much work, use a standard buttercream recipe for the frosting. Pipe the buttercream in swirls on top of the cupcakes. Or feel free to create any other design. You are the Chef! Do ahead: You can bake the cupcakes a week or two in advance and store them, well wrapped, in the freezer. You can also fill them before you freeze them. They also keep filled in the fridge for a day.